An enduring favorite, this classic, cardigan twin set is refreshed with a colorblocked print detail. Worn with jeans, pull-on pants or a pencil skirt, this must-have wardrobe extender is a timeless tradition for savvy style. Beautiful, comfortable and always perfect fit. Thank you Anthony! Wore this to an affair and felt elegant in it. This set is very nice, looks very classy. Able to wear the jacket with other tops as well. I just ordered the matching striped pants to go with this set. I love the fit and fabric and will be able to coordinate this top set with both solid black and turquoise pants. 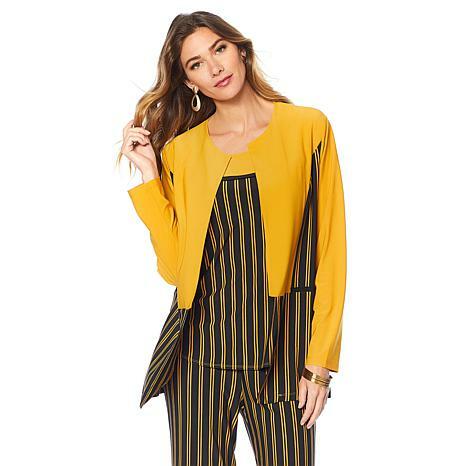 I ordered the color block jacket and top set in a size medium in the black tweet. The fit and the length was perfect. It went well with matching tweet pants. The material is a medium weight and feels good to the skin.